What are multifocal contact lenses and how do they work? Multifocal contact lenses, or varifocal contact lenses, have been designed to correct the visual issue of presbyopia. They blend together two or more prescriptions to allow your eyes the ability to focus on objects at all distances, giving you the freedom from wearing varifocal glasses. Multifocal contact lenses are also known as ‘varifocal contact lenses’ or ‘progressive contact lenses’. Presbyopia is a common refractive error, and typically becomes a problem as we get older. It most commonly starts to appear when an individual reaches the age of 40 and is the most common form of near sight vision loss. Presbyopia greatly reduces the eye’s ability to focus on close-up objects, hence one of the first and most common symptoms of the condition is difficulty while reading or making out small details. Vision often becomes blurry and people find they must squint or alter the distance of the object/book they are looking at. Presbyopia occurs when the lens of the eye becomes hard, causing the eye to focus light behind, rather than directly on the retina when looking at close objects. Some people are surprised when they develop presbyopia having never had an eye condition before, but a previous eye condition or lack thereof, is not a precursor for presbyopia. Thankfully, presbyopia can be easily diagnosed with a simple eye test and just as easily treated with a specific type of prescription. This is done using multifocal or varifocal contact lenses. You can learn about presbyopia in more detail in our Eye Care Hub. What are the differences between bifocal and multifocal/varifocal contact lenses? But all you really need to know is that ’bifocal’ specifically refers to contact lenses with exactly two prescriptive powers in, whilst multifocals (or varifocal contact lenses) are any lenses with more than one. Typically, multifocal lenses have a range of more than two prescriptions, however the term ‘multifocal’ is frequently used to describe bifocal lenses. Aspheric – This is the most common type of multifocal/varifocal contact lens. Short and long-distance prescriptions are blended together, allowing for your eyes to select the required prescription right in front of the pupil. As with regular and toric contact lenses, we stock a wide selection of daily, two weekly and monthly editions of your varifocal contact lenses. Which multifocal contact lenses are the best for me? It depends on each individual which multifocal contact lenses are best, as well as what they have been advised by their optician and what their prescription is. 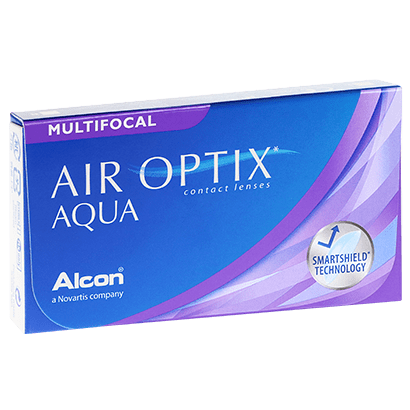 For presbyopic correction from a daily disposable lens, popular choices include 1 Day Acuvue Moist Multifocal and Dailies AquaComfort Plus Multifocal. Alternatively, if you’re a monthly contact lens wearer, you might want to try PureVision Multifocal or Biofinity Multifocal. Which are the best multifocal contact lenses for dry eyes? Multifocal contact lenses are made by the same type of injection moulding process other contact lenses are made by. Different brands, however, use a variety of materials and which one you choose depends which brand you opt for. Silicone hydrogel lenses offer a high level of breathability and surface comfort, making them a great option for those who suffer from dry eyes. 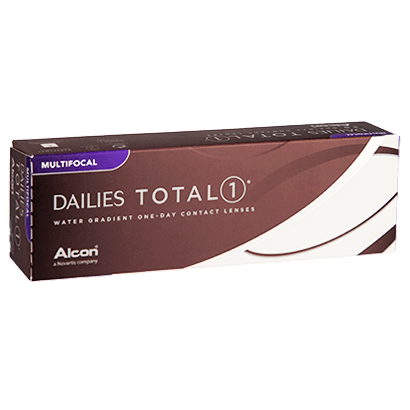 Dailies Total 1 Multifocal, Biofinity Multifocal and Air Optix Aqua are all silicone hydrogel lenses that offer exceptional comfort and hydration for those who suffer from dry eyes. Which multifocal contact lenses are best for astigmatism? If you have astigmatism and presbyopia, we currently stock one speciality varifocal contact lens that can cater to your vison. 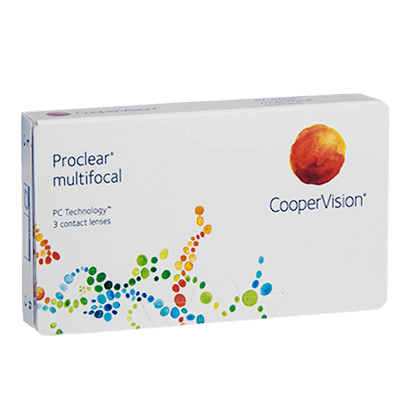 Proclear Multifocal Toric is a high-performance lens specifically designed for people that have both a multifocal and astigmatic prescription. As a monthly lens, it offers great value for money, as well as uncompromising comfort due to its high water content, which maintains hydration and moisture for your eyes. Are there coloured multifocal contact lenses? Unfortunately, coloured contact lenses are not available for multifocal prescriptions at this moment in time, and neither are there any manufacturers that currently offer this. Feel Good Contacts offer the cheapest prices on multifocal contact lenses online in the UK. With our Price Match Guarantee, we promise the cheapest prices on your multifocal contact lenses compared to any other contact lens retailer in the UK. We stock a variety of multifocal contact lenses for daily, monthly and two weekly wearers, as well as those who need multifocal contact lenses and have astigmatism. What are the best daily multifocal contact lenses? 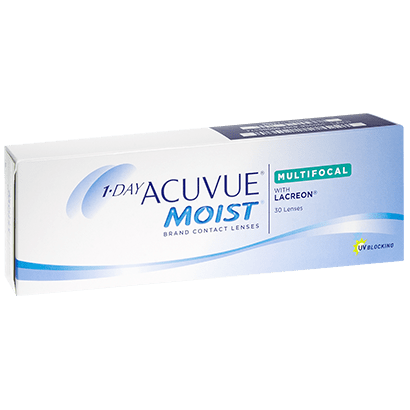 Part of the Acuvue Moist range, these multifocal daily disposable contact lenses offer excellent presbyopic correction with an aspheric design that helps the lens follow the eye as it moves. 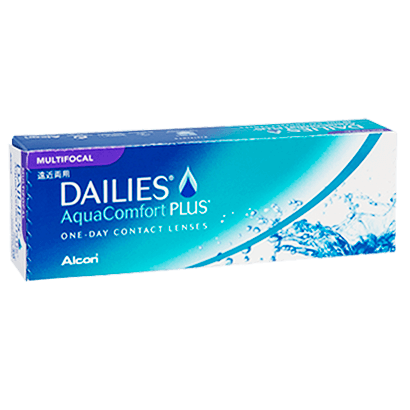 LACREON® technology is the main element in these innovative daily disposables, locking in moisture and offering long-lasting hydration, particularly useful for those suffering with dry eyes. Created by Alcon & Ciba Vision, these daily multifocal contacts ensure seamless vision between different distances for your eyes. Highly convenient, they can be disposed of after use. Just put your lenses in when you wake up, enjoy a full day of wear, before disposing of them before bed. You can then insert a fresh pair of lenses in the next day. These multifocal daily contact lenses can be worn for up to 16 hours a day, due to their high-water content and silicone hydrogel material. By wearing a new set of lenses every day, you can rely on total hygiene and enjoy complete visual clarity and comfort for the day before simply throwing the lenses away before going to sleep- no cleaning or storing routine needed. What are the best monthly multifocal contact lenses? The silicone hydrogel material of these monthly contact lenses allows for a higher flow of oxygen in and out of the eye. Offering up to six times the amount of oxygen offered by standard hydrogel lenses. 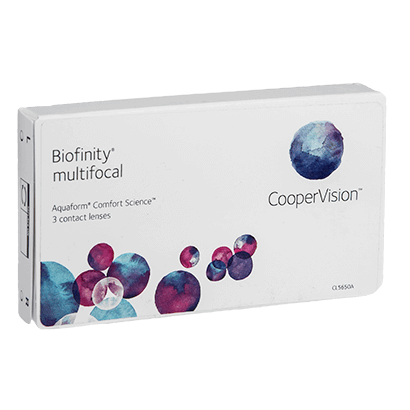 By using Unique Precision Profile technology, these multifocal contacts are able to contain multiple prescriptions into one lens and achieve complete visual clarity and crisp vision at short, intermediate and long distances. These monthly contact lenses deliver smooth and seamless vision at all distances for contact lens wearers with presbyopia. Made from silicone hydrogel for a refreshing and barely noticeable presence on your eye. Aquaform Technology works to lock in moisture and minimise the risk of dry eye for contact lens wearers. You can rely on hydrated, moisturised and healthy eyes with these multifocal contact lenses for presbyopia. The innovative lenses combine the benefits of a multifocal contact lens and a toric lens for astigmatism, multiple prescriptions are moulded together to achieve clear and crisp vision for the wearer, who needs to correct both presbyopia and astigmatism. Rest assured you will receive sharp and consistent sight throughout the day, unaffected by distortions. PC Technology helps to lock moisture into the lens, keeping them moist and hydrating your eyes throughout wear. What are the best two-weekly multifocal contact lenses? 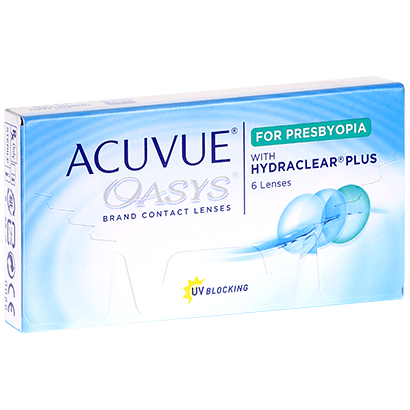 Acuvue Oasys for Presbyopia offer a two weekly wear, can be worn for a whole week without removal as an extended wear contact lens if approved by an optician. With an advanced aspheric design, multiple prescriptions and blended together with Stereo Precision Technology to correct presbyopia. As a silicone hydrogel contact lenses, the lens allows up to six times the amount of oxygen to flow through the material than hydrogel lenses. Hydraclear® technology helps to prevent dry eyes and aids water retention.